I need to pick up some HDMI cables immediately. We've been using a set that we purchased from Monoprice about a year ago. Unfortunately, they aren't quite long enough to run through our walls, and their nylon jackets make them rather stiff and inflexible. We're also looking at speakers - we currently have a Bose Acoustimass 5.1 double-cube speaker system in our living room. It gets the job done, and the speakers are very small. We could certainly use some wall mounts and incorporate the Bose cubes into the new home theater system. It would look fine, and would cost nothing. But we're also considering in-wall speaker solutions. Our TV has 4 HDMI cables running to it at the moment - the DirecTV box, the AppleTV, the Blu-Ray player, and the stereo / ARC channel. Unfortunately, while the previous owners of our home ran power and coaxial cable to the TV location above the fireplace, the coaxial box above the fireplace serves no purpose. We need HDMI up there, not coax. So we're going to need at least 4 HDMI cables buried in the wall , running from above the fireplace to the future location of our components. All of those HDMI cables will need to be about 15 feet long, and they'll all need to be high-speed, as at least 3 of our components output 3D. Fortunately, the price of HDMI continues to drop. 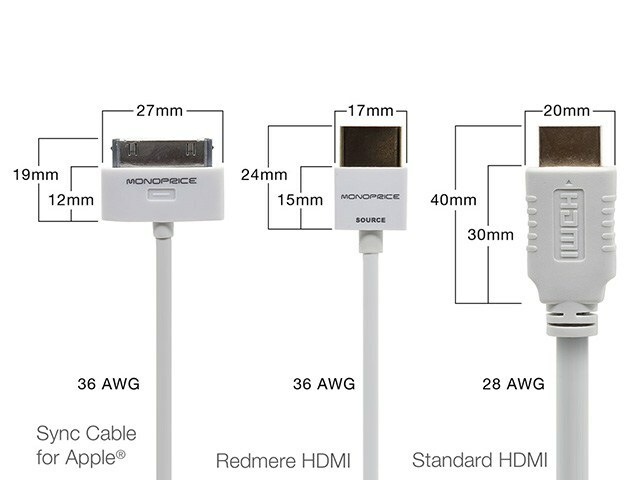 Today on Monoprice they're selling the "Redmere" HDMI cables pictured here, at 15 foot lengths, for $15.91 each. Take a look at that picture on the right! These are small, small HDMI cables. The cables are tiny - basically the size of an iPhone charge cable. The plugs are about half the size of previous HDMI cables - and the more I think about it, the more I think this is a game-changer. You'll only have to leave about half as much clearance on the back of your components. We used to need about an inch and a half, once the plug (and some inflexible cable) were taken into consideration. Now, it will be 15 millimeters for the plug, and basically nothing for the cable. I'm loving this. 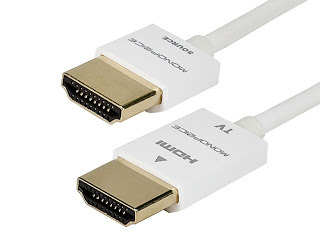 I don't know how they managed to cram so much HDMI goodness into such a small package, but it probably has something to do with the reason why these are now one-directional -- there's a "TV side", and a "Source side". That's not a problem at all in most cases, but I wonder if my Audio Return Channel will need a 2-way cable. I'm thinking that the answer is yes. HDMI, DisplayPort and DVI are all digital standards used for High Definition video signals. DVI & DisplayPort (V1) only carry the video-image signal but no audio, where as HDMI covers each. Thus if you use a DVI or DisplayPort (V1) cable, you'll need to connect audio cables from your DVD-player, CPU, games console or cable/satellite receiver to your TV.